At this time I have only one Odd Fellows souvenir spoon to share with you. I guess that I am considering the name in relationship to modern culture, but it sure sounds like an "odd name" for a fraternal group. Since I am lazy and not doing research on this organization, we will have to accept the name as given. 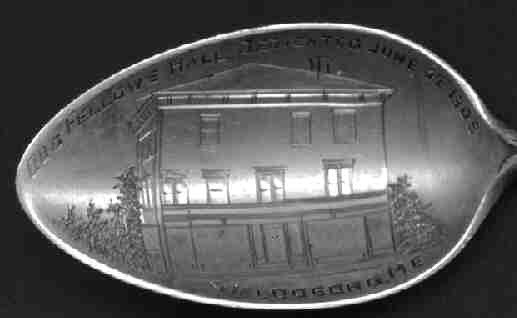 "Odd Fellows Hall dedicated June 22, 1905"
Therefore this must be a spoon from the opening ceremonies.